Century - Our Royal Series of fiberglass truck caps is perhaps the most sleek and contemporary of its kind. An industry-first all-glass, compound-curved rear door; flush-mounted LED third brake light and curved side windows add to the Royal's "GQ" good looks and appeal. 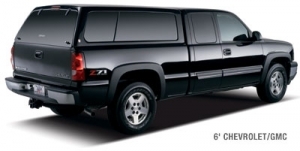 The tight fit and smooth flowing lines will make your pickup truck look like a luxury SUV. Makes your pickup truck look like an SUV. *Signature Series Package - Black headliner, twist handle with power door lock, 2 clothes hangers, fold down front picture or slider window.